While this map is exclusively for Wisconsin, educators can either use it as a case study or as an example of how to create something similar for their own state. There is a more advanced version of this map showing a range of future forecasts on this website: [link http://www.wicci.wisc.edu/climate-map.php]. Wisconsin students could graph average temperature data for each decade at their specific location in Wisconsin. 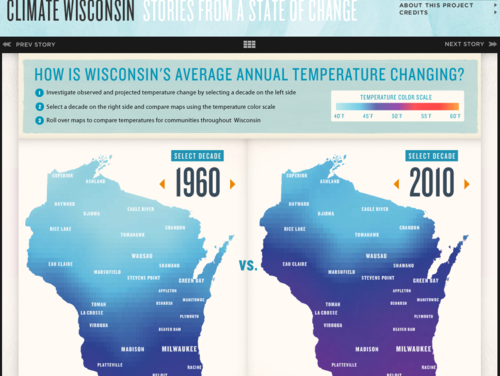 A clear and easy-to-use interactive that students can use to compare average temperature change each decade, beginning with 1960, for selected cities in Wisconsin. Comments from expert scientist: This document clearly discusses relevant temperature projections for the state of Wisconsin. It's a quality summary with a clear message. I like the length, citations, and the flow. Students are able to select two decades (from 1960 to 2090 ) and the location within Wisconsin to compare. Focused strictly on Wisconsin but could be of interest to other Midwestern states. There are teaching tips provided on this webpage. Additional video segments that support this topic can found on the bottom of the page. Educator should be encouraged to scroll down to the bottom to show students the impact of temperature change across different industries. The visualization does not require much support from a teacher. Instructions at the top of the webpage are clear and easily understood. Broken link to University of Wisconsin-Madison lakes researcher John Magnuson.